While American solar power has increased four-fold since 2010, state by state, utilities and powerful industry front groups have begun chipping away at key policies that helped spur this solar boom, according to the analysis, Blocking the Sun: 12 Utilities and Fossil Fuel Interests That Are Undermining American Solar Power. The playbook: a national network of utility interest groups and fossil fuel industry-funded think tanks provides funding, model legislation and political cover for anti-solar campaigns. The report examines five of these major national players — Edison Electric Institute, American Legislative Exchange Council, the Koch brothers and their front group Americans for Prosperity, the Heartland Institute, and the Consumer Energy Alliance. Then, in state after state, electric utilities use the support provided by these national anti-solar interests, supplemented by their own ample resources, to attack key solar energy policies. The report features seven utilities — Arizona Public Service, Duke Energy, American Electric Power, Berkshire Hathaway Industries, Salt River Project, FirstEnergy, and We Energies. Charles and David Koch have an enormous financial stake in the fossil fuel industry through their company Koch Industries and its many subsidiaries. Koch Industries alone operates around 4,000 miles of pipeline, along with oil refineries in Alaska, Minnesota, and Texas. Through its front group Americans for Prosperity and funding to other like-minded entities, the Koch brothers have attacked solar laws in several states including Florida, Georgia, Kansas, North Carolina, Arizona, Minnesota, Ohio, South Carolina, and Washington state. 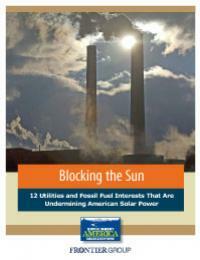 Utilities like Arizona Public Service augment resources from interests like the Kochs to forward an anti-solar agenda. APS admitted to funding anti-solar ads by 60 plus, a national Koch-backed front group that purports to represent seniors, and it has been accused of improper influence with the Arizona Corporation Commission. APS’s latest stealth move against solar has been to withdraw its request to raise fees on solar owners until the commission completes a study that would only examine costs, and not benefits, of the resource. In Florida, where solar capacity is far beneath its potential, Koch-backed Americans for Prosperity and Duke Energy, the largest utility in the U.S., have teamed up to block pro-solar policies. Duke Energy spent heavily to help re-elect Gov. Rick Scott, who campaigned against a state renewable electricity standard. AFP has mobilized its members and waged an aggressive ad campaign against a ballot initiative to expand rooftop solar by allowing third-party sales of panels. Duke Energy has also contributed to that effort. The anti-solar coalition Consumers for Smart Solar, backed by AFP, Duke Energy, and others, has now put forward a competing ballot measure in Florida to undermine the rooftop solar amendment and is spreading misinformation about both measures.